*This is a summary of the some of the main questions and answers picked up from a number of questions relating to the Business Report and Agendas. While the labor law suits are resolved, the issues were widely covered in the media. I am concerned about the impact on future hiring. Would you explain how you are handling this? I was delighted to hear that the Gotemba Plant, located in my hometown, will be reoperated. Please explain how you will use the plant. We are planning to reoperate it as an Eco Business Development Center. We will develop new businesses focusing on protection of the global environment. In addition to developing environmental technologies and reuse and recycling, it will be the central global base for environmental businesses. Please look forward to this. The stock price is not performing well. What are your thoughts on the responses to the business model and changes in the environment? I am certainly not satisfied with the current stock price. I think the first key is to raise our performance. It is also important to make sure that the stock market is aware of this fact. We will respond to changes in the environment and provide new values that combine goods with idea, as we can’t expect future growth in existing business in developed countries. In emerging countries, based on the judgment that markets are still growing, we will steadily expand our business through our core businesses. We will develop our new businesses as we earn cash mainly through our existing businesses. Compliance issues are arising at other companies. 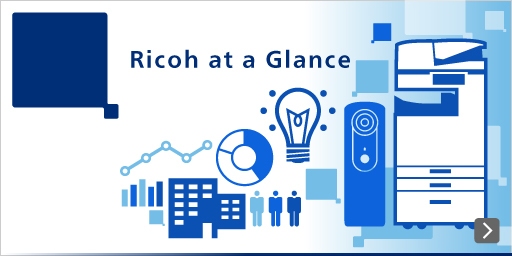 It seems that Ricoh is undergoing various measures, such as changing the accounting standards to International Financial Reporting Standards, but I hope you will continue with your efforts to strengthen compliance. We are laying the best possible structure for audits and compliance and will continue sincere management in the future. I appreciate that the labor dispute has been settled. However, I also hear that there are still some employees who have been redeployed and transferred who cannot work at their desired divisions. I would like you to soon resolve this problem as well. We are aware that as a responsibility to our shareholders, it is important to continually improve corporate value. For this reason, it is necessary to optimally allocate personnel. Therefore, although we sometimes may not be able to allocate all employees according to their wishes, we would like to make allocation openly to the extent possible, so that all employees are fully convinced. Ricoh’s stock price is performing poorly. Are you providing appropriate information to analysts? In order to raise the stock price, the first important factor is raising our performance. In addition, we are also aware that provision of information in order for the stock market to evaluate us appropriately is very important. We plan to continue focusing on these efforts. Please tell us about the future plans for shareholder returns. Cash created through businesses will be allocated to distribution to shareholders, investment in new businesses, and improvement in financial structure. In the fiscal year ending March 31, 2016, we are first planning a \1 increase in distribution to shareholders. In the future, we are considering a distribution to shareholders not only through dividends, but also through purchase of treasury stock, depending on the status of cash generation. What do you do to raise the motivation of developers? We take measures to raise motivation of employees including a bonus system, not only for those directly involved in manufacturing, but for all employees. We believe that corporate value is raised by the employees, and we want to become an even better company. These days I often hear about the IoT (Internet of Things). Please explain the connection between Ricoh products and the Internet. We are connecting image sensing devices using optical and image-processing technologies to the Internet and conducting added-value business as we also take similar measures in the Industrial Products segment such as FA. Ricoh has strong technology related to the IoT, such as improving service by connecting multifunctional printers to the Internet. Please explain your thoughts on the strategies for each region. In particular, please explain in detail your strategy in Europe and Asia. In Europe, we are becoming more competitive through consolidation of back-office operations at sales offices and related measures. In Asia, including China, India, Indonesia and Oceania, further economic growth is expected. We are also strengthening technical support for our sales partners, such as stores and distributors. In addition, for major customers that are expanding business globally, we are developing businesses accordingly. I want to make a request about shareholder benefits and support system for cameras. It seems the Kansai region doesn’t have as much offerings available as the Kanto region. I’d like to see improvements. We are gradually improving shareholder benefits and expanding the regions for participation. We would like to further improve this in the future while listening to the opinions of shareholders. Camera support is also exactly as you pointed out. We want to make improvements in the future. Regarding camera repair, we would also like you to use the pickup repair service.